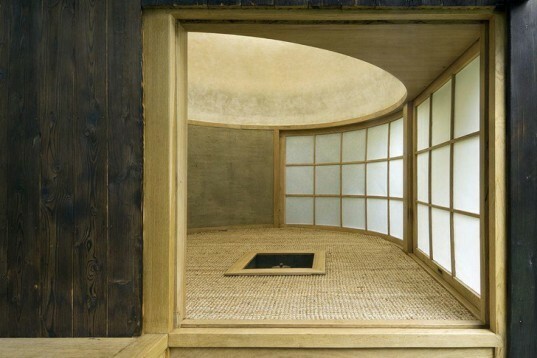 Inspired by the cultural activity of the Japanese tea ceremony, Tea House in the Garden is a round, minimal space to gather with friends. Situated in a private garden in Prague, the shelter was designed by local A1 Architects and was built in 35 days. Made from natural materials and traditional Japanese building techniques, this minimal sanctuary stands among apple and cherry trees. Situated within a slightly wild, graceful private garden, the Tea House offers a great space to retreat from the world. Its round shape takes the guests’ attention to the center where the tea is prepared, creating a close bond with all who are present. The mat was woven from dried plants, one wall was made from clay, and the ceiling boasts a huge paper dome that filters natural light creating a serene atmosphere inside. Tea House in the Garden was designed by A1 and built with master of construction Vojtech Bilisic. It stands on stones, and the carpentry was built from oak covered with burnt larch cladding. A small sacred building where time flows at its own pace, Tea House in the Garden is the perfect space for quiet contemplation or gathering over a cup of matcha. Situated within a slightly wild, graceful private garden, the Tea House offers a great space to retreat from the world. Its round shape takes the guests' attention to the center -- where the tea is prepared -- creating a close bond with all who are present. The mat was woven from dried plants, one wall was made from clay, and the ceiling boasts a huge paper dome that filters natural light. Tea House in the Garden was designed by A1 and built with master of construction Vojtech Bilisic. 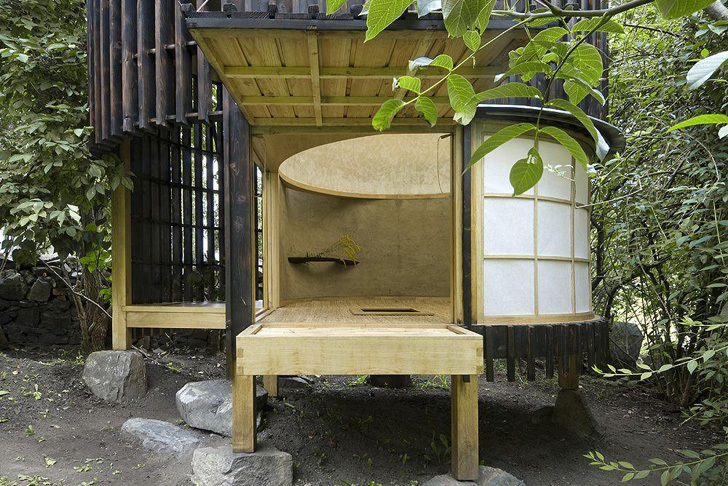 A small sacred building where time flows at its own pace, Tea House in the Garden is the perfect space for quiet contemplation or gathering over a cup of matcha.